I'm working on some new stories and activities for teaching theme. I'm trying to create activities that draw students' attention to some higher level literary devices as well as giving them some concrete tools for identifying and supporting theme. Right now I have three different stories, best suited for readers in grades 3-5. If you would like to test drive them with your students, leave a comment or write to me by October 1. I'll try to get things sent out by next week. I'd love to see some more followers too! One of the hardest things about working with struggling intermediate readers is knowing where to begin. Listening to one running record may suggest five different issues to attack--each separate from the regular curriculum that still must continue to be taught. Students who might be reading at the same level still have very different strengths and needs. But all of them have to be able to cope with grade level text. It can all seem very overwhelming at times. And it is! Here are some things that I've learned that are helping me to structure my time with these readers. What is the purpose of reading? By the time they reach fourth grade, some students still haven't been able to synthesize decoding the words with building a mental model. It's important to remind students that this is what we're here to do. But mental models can fail for a number of reasons--lack of attention, lack of vocabulary, lack of working memory capacity. This week, I've started each lesson with some practice in building a mental model. I do this with a quick little imagination game. "Imagine that you are walking down a long aisle," I said. "You are pushing a metal cart. You are taking boxes off a shelf and putting them into the cart. Where are you?" Throughout the week, we did more little scenes, talking about the role that our background knowledge plays in each one. 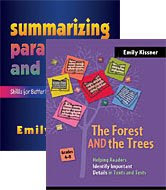 I also used the visualizing assessment texts that you can find here as instructional pieces. 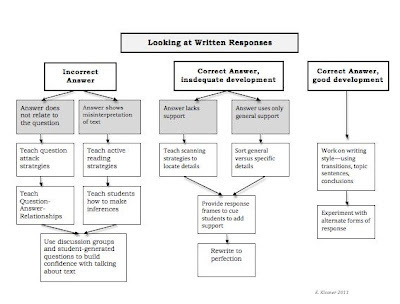 Once students understand building a working model, it's easy to introduce clicks and clunks. 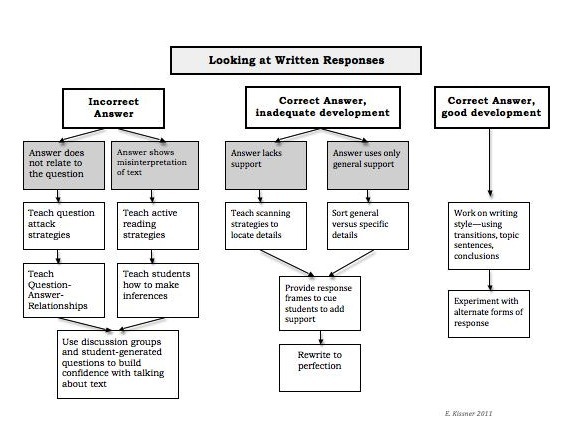 In the past, I've started with reviewing reading strategies like inferring, summarizing, synthesizing, and connecting. But the problem with these reading strategies is that they are just more words for the kids to remember. It works fine with on and above-grade level readers. For struggling readers, though, too much terminology can clog up the process. I have tall yellow flowers growing in my garden. I have green basil growing in my garden. This was a clunk for almost all of the students. When I asked why it was a clunk, they were able to report immediately--they don't know the word basil. But I chose this sentence because I have basil in my garden outside and on the windowsill in my classroom. I directed their attention to look at the basil, and then said the sentence again. This time, the sentence was a click! We talked about how readers can solve problems in many different ways. Our school has an intervention period. Based on our benchmark assessment data, we have organized the students into small groups for fluency interventions. We have five people working with about 50 kids, which makes our groups a wonderful size. Repeated reading is a proven technique for improving fluency. However, repeated reading in a large class can get very loud. Having smaller groups makes best practices like choral reading, repeated reading, and retelling much easier to manage. And I can listen to kids read frequently without worrying about what the other 25 students are doing. I have always worked on grade level text with readers of all abilities. (In fact, there is a section about it in the chapter about text-based inferencing in my book, The Forest and the Trees.) With struggling readers, I like to approach grade level text in smaller quantities, and on photocopied pages that students can write on. Even though I have enough copies of this book for my entire group, I've found that struggling readers just do better when they don't see the entire book at once. It's important for intermediate readers to know that there are some parts of a story that are meant to be mysterious. The students grew increasingly impatient with the character of Plastic. "What is Plastic?" one boy asked, taking the book from my desk to look at the cover. What's neat about this question is that the author meant for this to be a mystery, and Plastic's identity is revealed in the next chapter. Working with struggling readers is hard. Anyone who says otherwise is selling something. We all want our students to improve quickly. But struggling readers often have unexpected growth patterns. They may improve in one area, but worsen in another. They may flatline for several months. They may do beautifully on a skill with teacher direction, but fail to apply the strategies on their own. It's important to find someone who can talk you through these ups and downs and help you to find the bright spots. At my school, I'm lucky to co-teach with a special educator. And the brightest of bright spots are often the students themselves. When working with struggling readers, it's most important to get to know the readers themselves. I use the data to help me make plans for my students...but then I try to forget about the data while I'm working with the students. We had so much fun reading the first chapter of Toys Go Out together and laughing about StingRay's mistaken ideas about a vet. Yes, it's hard, but it's also rewarding. Now that the school year is underway, I am giving careful thought to finding out about my readers. What do I know about them? What do I need to know? I begin with last year's test scores. I think that these are valuable in that they tell me what readers can do with extended texts in a rigorous situation. But these scores are not enough, especially for those who are struggling readers. Our next step is to assess students. Our team has found great success with the short assessments in the CORE book. The screening tools are quick to give and help us to see patterns. Next, we do the oral reading fluency measures in Scholastic's Fluency Formula. I like the assessment in which we do three one-minute measures, and then take the median score as the one that we record. This helps kids to get over their nervousness of reading aloud to us! With all of this data in hand, we can start planning intervention groups, guided reading groups, and everyday classroom instruction. That is when the fun can begin! It's been quite a week. We've tried our hardest to keep cool in the muggy September afternoons! Teaching in a 60-year-old building has its charms, but lack of air conditioning is not one of them. 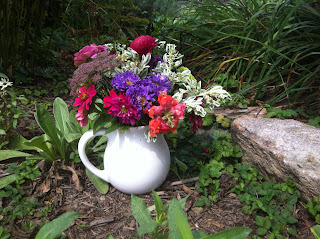 Of course, on Wednesday night, I decided that I was hot and sweaty already--might as well go pick raspberries and flowers! 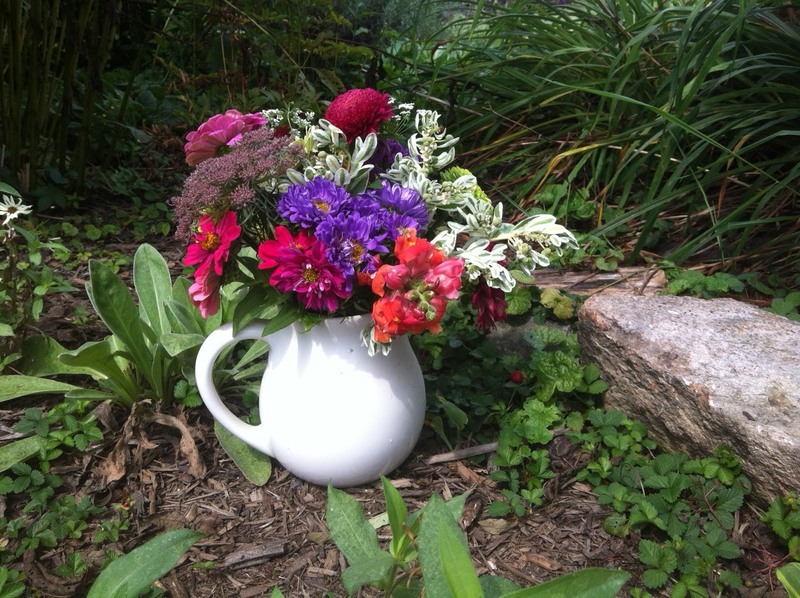 The end result was a gorgeous bouquet, four pints of fresh berries to give to colleagues, and two big containers of jam. In school this week I've worked hard to get kids working on independent reading, just like I do every fall. I'm glad that I wrote these lesson plans several years ago--I still print them and follow them each year! The start of the school year is overwhelming enough without starting from scratch. The path to independent reading starts with read alouds. During read aloud, I can model the kinds of thinking that I'm expecting of students during independent reading. Over the course of this week, students slowly took over the task of thinking about our shared texts. Tuesday: Students shared their thinking with a partner. I generalized the kind of thinking from what they shared ("You shared a question. Questioning is a kind of thinking that readers do.") and made a chart. Thursday: Students wrote their thinking on two sticky notes about our read aloud, and then two sticky notes from independent reading. They tried to categorize their thinking and wrote symbols like question marks, exclamation points, or stars to represent different kinds of thinking. Friday: Students graduated to putting their thinking on a chart that they will use over the next few weeks. But what books do I choose to start the year? I like to change things up. One thing that I wanted to do this year was give kids a taste of books that are not easy, and that do not yield their secrets quickly. But this is not always successful when kids are hot and sweaty. So I had to be very careful in my book picks, probably more careful than those lucky teachers in chilly buildings. Instructions by Neil Gaiman turned out to be a good choice. I spent most of last summer devouring Neil Gaiman's books for adults, so when I ran into this in a beachside bookstore I knew I had to have it. It's interesting enough to keep kids entranced, and short enough to read in just a few moments. But it leaves a reader with more questions than answers. In case you haven't read it, the book is a poetic set of instructions for a quest, shown acted out by a fox. It looks like a fairy tale, reads like procedural text, and leaves you thinking. 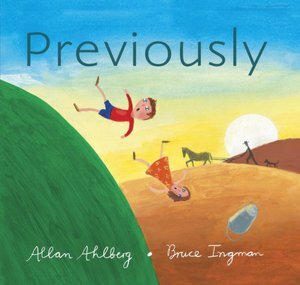 Previously by Allan Ahlberg turned out to be loved by some, hated by others. Perfect for teaching about reading ratings! (Hm, can you tell that I read a lot of British fantasy over the summer? Like dark chocolate, it's left a taste in my mouth.) This story upends fairy tales by telling what happened--well, previously. Never before have I thought that the Jack who fought the giant was the same Jack that fell down the hill! The students liked the illustrations, especially the endpiece that shows the characters as babies. My computer has broken recently. I knew it was going to happen, so luckily I made backups of everything. In going through my files, I found old, old files and felt a bit of nostalgia for things that I haven't done in a long time. 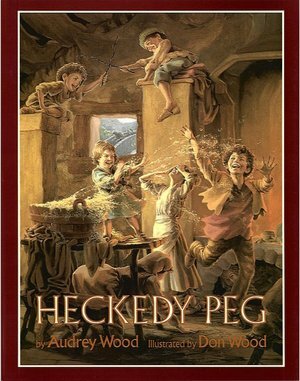 This led me to choose Heckedy Peg, a used bookstore find, as a read aloud. I first met this book when I was teaching a 4 year-old preschool class long ago. The center director was a fabulous teacher who sometimes read this book to the students before naptime while I cleaned up from lunch and set out cots. While some might not want to share a book with a scary witch in it with young children, this director knew that kids need fairy tales and an element of danger. Besides, Heckedy Peg stars a wonderful mother who bravely and cleverly gets her children back. It was a big naptime hit. Would fourth graders enjoy this as much as preschoolers? Absolutely! They all wanted to read it again during independent reading time. One boy asked to take it home for the weekend to read to his mother. From a teaching standpoint, I love how an event in the beginning of the book (what the children want their mother to bring home from the market) leads to the resolution of the conflict at the end of the book. Many traditional fairy tales just don't hang together this well. 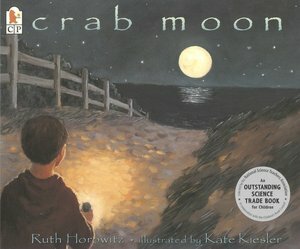 I have written about Crab Moon before. I love the paintings in this book. For teaching about narrative and informational text, this book is a must. It has information in it, but is still definitely a narrative. This leads to a great discussion with students about the differences between narrative and informational text. Crab Moon also helped me to learn some important information about my readers. After the main character, Daniel, helps a horseshoe crab, he grins. I asked the students, "How do you think Daniel feels on this page?" They shared their thinking with partners, and then several shared with the whole class. The consensus was that Daniel felt "happy" (proud did not make an appearance). Despite repeatedly asking, "What in the text might makes you think this?" and rereading the last paragraph on the page, I couldn't get any student to refer to the fact that Daniel grins to support their inferences. (And I feel that I can only go so far with leading questions. If the skill isn't there, it's not there, and dragging it out of kids isn't going to solve anything.) So I know that my work is cut out for me as far as supporting inferences with evidence from text. I'll start with this in small group reading sessions next week, using texts that support text-based inferences. 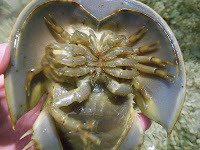 After we read the book together, I shared my own pictures of horseshoe crabs. These led to more talking and questioning and led several students to choose the informational books about horseshoe crabs that just happened to be prominently displayed. This is the beginning of matching details from different texts, which in turn is the beginning of becoming an expert...so big things were happening. So it's been a productive week. In between reading times we have done tons of screening assessments. While these numbers are useful, I really think that the time we share in read aloud tells me just as much about what this year's classes will be like. I'm looking forward to getting to know all of the readers even better!